1 Sky Director Gillian Caldwell confronted President Obama over his position on “clean coal” at an event, and I think the video is worth sharing. You can see Gillian’s blog post about it as well. Now, as whole I’m a supporter of Obama’s presidency. After 8 years of Bush I’m infinitely happier with Obama as president. I think Obama understands the critical issues around clean energy and climate change. Although he needs to show much stronger leadership and be more vocal with the media, I have considered the stimulus investment, stronger fuel economy standards, as well as his administration’s aggressive behind the scenes arm-twisting over the Waxman-Markey bill(which I support) to be pretty good. At the same time, I’ve criticized his administration over the EPA ruling on mountaintop removal, as well as his stance on clean coal, which is no secret at this point. The tar sands aren’t looking too good either. But the notion that Obama can stand there and proclaim such outstanding support for a bought out Congressman is absolutely disgraceful and damaging. Not just because of Boucher’s efforts to drain what should be clean energy funding into longshot carbon capture and sequestration. That you would expect Obama to support. It’s the fact that Boucher was the leader on the Energy and Commerce Committee in weakening Waxman-Markey’s emissions targets and he pushed to weaken them further. It’s that Boucher took a 25% renewable electricity standard and a 15% efficiency standard and turned them into 20% combined together. These were the two biggest weakening effects. Although permit allocations and EPA authority are not at the top of my complaint list, Boucher had a big hand in those tamperings as well. If you could pick one member of the House that’s done the most damage to our efforts to pass a strong climate bill, it’s Rick Boucher. That’s why back in May, I was present at a direct action protest in the halls of Congress, where some blocked Boucher’s office and were arrested. At that event, one of the organizers Mike Tidwell, the director of CCAN and a friend talked about how Obama had all these goals for a good climate bill, and that Boucher was ruining Obama’s plan. If this really was so, Obama would not have such kind words for Boucher. These kinds of remarks along with the EPA’s inability to block mountaintop removal mining makes me quite perplexed when I hear activists say we should kill the current bill so EPA can work its magic. I seriously doubt EPA would do better even if it moved in a timely fashion and cleared all the legal hurdles. – I wouldn’t bet the planet on the EPA, and I doubt China or India would either. Let’s do our best to get a bill passed and improved out of the Senate that we can take to Copenhagen. – I don’t like Rick Boucher. – President Obama is doing some good things and some bad things. However, if he doesn’t adopt a much stronger public stance to pass a Senate bill and get a treaty in Copenhagen, his Presidency will go down in history as a colossal failure despite some of the good things he does. – You can’t take a stronger public approach if you’re holding hands adoringly with Rick Boucher. I’ve had a lot of posts recently about my Congressman House Majority Leader Steny Hoyer and the Clean Energy Town Hall Meeting on May 11th. So the moment of truth finally arrived! While I’m sure there will be more media to post, I’m going to reveal what I’ve seen thus far. First, Holly of CCAN had a post about the Town Hall, and she has her own insight on the meeting. CCAN also has a video of the Town Hall, in case you want to check it out. Next, the Diamondback has an article out about the meeting today, which I felt portrayed the meeting accurately, although didn’t mention the speakers before Hoyer. I got quoted too, and didn’t embarass myself too much. 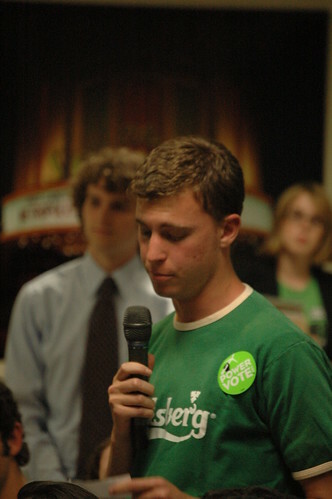 One thing Holly and I definitely agree on is the question of the night by a member of my student group UMD for Clean Energy, Jesse Yurow. If you see a politician asked ANY question this year, you have see this one. It’s right after the 1 hour mark on the video. We went over it in our student group meeting and he showed me what he had on his notecard before the town hall started. I knew it was going to be good if he got to ask. 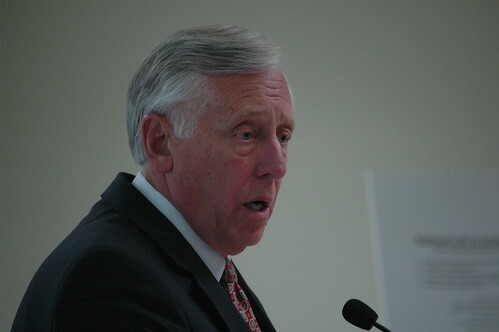 The question combined the fact that efforts to develop clean coal technology had failed, that the extraction of coal is destructive, and whether or not Congressman Hoyer would support a moratorium on new coal plants. This was followed by the entire audience roaring in applause. Now Hoyer doesn’t support this, and he said so, but I could tell it was tough for him. Picture is below. This is the look on Hoyer’s face…. All in all, this was a succesful meeting. There were 250-300 people attending, the speakers did a great job, and the audience got in a few great questions. The only unfortunate part was that the Congressman was supposed to talk for 15 minutes, but he rambled for 30 and there wasn’t as much time to ask questions as we would’ve liked. 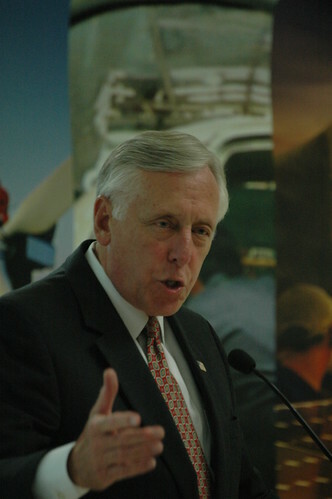 Still, despite our differences I’m very gracious that Steny Hoyer took the time out of his busy schedule to come to our campus and participate in this meeting. I’m going to likely have further analysis of this meeting, as well as more media and pictuteres. I will hold off on that stuff until the weekend. Clean Coal was Never Being Developed by Bush Admin! I’ve documented plenty of reasons why coal use needs to be phased out, and “clean coal” is a joke. In case you need a recap…..The coal industry has gotten a lot of much deserved negative press ever since the coal slurry dam disaster that happened a few months ago. This brought to light that, maybe we should regulate our coal ash. Of course, no amount of regulation will ever make \”clean coal\” a reality, especially considering that it’s extraction often involves the very destructive mountain top removal. Oh..and coal is getting more expensive. Now there is ANOTHER giant nail in the coffin. This nail is actually pretty sad. There’s been a new report released by the House Committee on Science and Technology which found that the Bush Administration was never actually seriously developing clean coal technology and their entire “FutureGen Program” was pretty much PR the entire time. So not only is there no such thing as “clean coal”, but there was never actually any legitimate attempt to develop it. This sets things back at least 10 years. Even if we got serious about it now, the report says that wide-scale deployment would be realistic in the year 2040. Thanks President Bush. So this spill fortunately wasn’t serious, but it just goes to show these incidents can hit close to home. The coal industry has gotten a lot of much deserved negative press ever since the coal slurry dam disaster that happened a few months ago. This brought to light that, maybe we should regulate our coal ash. Of course, no amount of regulation will ever make \”clean coal\” a reality, especially considering that it’s extraction often involves the very destructive mountain top removal. Oh..and coal is getting more expensive. So there is a great article by the economist exposing all of the problems of “clean coal”, and why it’s really a pipe dream. I would prefer to call it “slightly less dirty coal” coming to you in the far off future. There are more reasons every day to phase out and regulate coal. The coal industry has gotten a lot of much deserved negative press ever since the coal slurry dam disaster that happened a month ago. This brought to light that, maybe we should regulate our coal ash. Of course, no amount of regulation will ever make \”clean coal\” a reality, especially considering that it’s extraction often involves the very destructive mountain top removal. Oh..and coal is getting more expensive. Plus..it smells…sorry I don’t have link for that. So besides the fact that coal burning is driving global warming and causing giant clean-up messes, it’s also getting more expensive for ratepayers. A good example of this is a plant being constructed in Indiana. Check out the article here. It’s also worth noting that this rate increase doesn’t take into account whether nor not the plant will ever be using some for of carbon sequestration technology(“clean coal”), or whether the price of carbon will be increased by Congress when it decides to regulate emissions. Also, in case you’re unfamiliar with what Mountaintop Removal coal mining is, check out this column of mine : here which I wrote back in September where I shine light on what goes on. ***EDIT NOTE*** I just had an e-mail forwarded to me with even greater in depth detail of this disaster, which I think more appropriately describes this atrocity. I’m going to Copy and Paste the e-mail below, in case people wanted greater background on this. There was a huge and terrible environmental disaster in Tennessee yesterday. 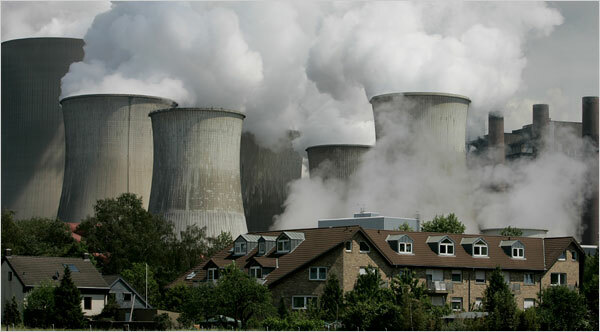 The Tennessee Valley Authority, better known as TVA, has a coal-burning power plant located near Harriman, Tennessee, along Interstate 40 between Knoxville and Nashville. The stuff that is left over after TVA burns their coal is called coal ash. Coal ash contains mercury and dangerous heavy metals like lead and arsenic – materials found naturally in coal are concentrated in the ash. TVA has a huge mountain of this coal waste material stored in a gigantic pile next to their Harriman (Kingston) power plant, alongside a tributary of the Tennessee River. On Monday morning Dec. 22 around 1:00 am, the earthen retaining wall around this mountain of coal ash failed and approximately 500 million gallons of nasty black coal ash flowed into tributaries of the Tennessee River – the water supply for Chattanooga TN and millions of people living downstream in Alabama, Tennessee and Kentucky. This Tennessee TVA spill is over 40 times bigger than the Exxon Valdez spill in Alaska, if local news accounts are correct. *** This is a huge environmental disaster of epic proportions. The local media are downplaying the spill, but the Nashville newspaper (The Tennessean) has a decent article, posted below. When I first saw the 300 million gallon Martin County coal sludge spill in Kentucky in October 2000 I was outraged. I was sure that it would be a national news story, but it never was, because the coal companies and local law enforcement blocked the road leading to the spill and kept the media out. The national media was confused because they didn’t know what “coal sludge” was. And ….the big national environmental groups didn’t do enough to bring media attention to the Martin County disaster. Please help – we need volunteers to take pictures and video of the spill and post them on the web. We need first hand accounts and documentation of the spill. We need letters to the editor. We need calls and emails to our leaders in Washington and Nashville and Frankfort and to President-Elect Obama. Please fwd this email to other concerned people and the news media. *** There is no such thing as clean coal! Look at the video of this spill. “Clean Coal” is The Big Corporate Lie. This horrific disaster in Tennessee can be the turning point in our nation’s struggle to build a new network of clean modern renewable sources of energy, like wind and solar power – but we have to raise awareness of this disaster immediately. Thanks for reading. HARRIMAN, Tenn. — Millions of cubic yards of ashy sludge broke through a dike at TVA’s Kingston coal-fired plant Monday, covering hundreds of acres, knocking one home off its foundation and putting environmentalists on edge about toxic chemicals that may be seeping into the ground and flowing downriver. One neighboring family said the disaster was no surprise because they have watched the 1960s-era ash pond’s mini-blowouts off and on for years. About 2.6 million cubic yards of slurry — enough to fill 798 Olympic-size swimming pools — rolled out of the pond Monday, according to the U.S. Environmental Protection Agency. Cleanup will take at least several weeks, or, in a worst-case scenario, years. The ash slide, which began just before 1 a.m., covered as many as 400 acres as deep as 6 feet. The wave of ash and mud toppled power lines, covered Swan Pond Road and ruptured a gas line. It damaged 12 homes, and one person had to be rescued, though no one was seriously hurt. Much remains to be determined, including why this happened, said Tom Kilgore, president and CEO of the Tennessee Valley Authority. “I fully suspect that the amount of rain we’ve had in the last eight to 10 days, plus the freezing weather … might have had something to do with this,” he said in a news conference Monday on the site. Ashen liquid similar to that seen on a much larger scale in Monday’s disaster came from the dike, they said. “It would start gushing this gray ooze,” said Don Smith, whose home escaped harm. “They’d work on it for weeks and weeks. The U.S. Coast Guard, EPA, Tennessee Emergency Management Agency and Tennessee Department of Environment and Conservation were among agencies that responded to the emergency. Coal is burned to produce electricity at the Kingston Fossil Plant, notable for its tall towers seen along Interstate 40 near the Harriman exit in Roane County. Water is added to the ash, which is the consistency of face powder, for pumping it to the pond. The ash is settled out in that pond before the sludge is moved to other, drier ponds, Kilgore said. Coal ash can carry toxic substances that include mercury, arsenic and lead, according to a federal study. The amount of poisons in TVA’s ashy wastes that could irritate skin, trigger allergies and even cause cancer or neurological problems could not be determined Monday, officials said. Viewed from above, the scene looked like the aftermath of a tsunami, with swirls of dirtied water stretching for hundreds of acres on the land, and muddied water in the Emory River. The Emory leads to the Clinch, which flows into the Tennessee. Workers sampled river water Monday, with results expected back today, but didn’t sample the dunelike drifts of muddy ash. That could begin today, officials said, and the potential magnitude of the problem could make this a federally declared Superfund site. That would mean close monitoring and a deep, costly cleanup requiring years of work. “We’ll be sampling for metals in the ground to see what kind of impact that had,” said Laura Niles, a spokeswoman for the EPA in Atlanta. Stephen Smith, with the Southern Alliance for Clean Energy in Knoxville, said those concerned about water and air quality have tried for years to press for tighter regulation of the ash. 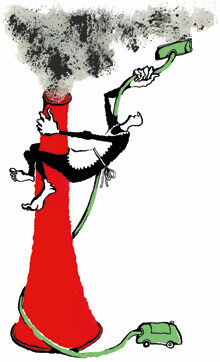 The heavy metals in coal — including mercury and other toxic substances — concentrate in the ash when burned, he said. Chemicals and metals from coal ash have contaminated drinking water in several states, made people and animals sick in New Mexico, and tainted fish in Texas and elsewhere, according to Lisa Evans, an attorney with Earthjustice, a nonprofit national environmental law firm that follows the issue. “It’s discouraging because this is an easy problem to fix,” she said. Ash could be recycled by using it to make concrete and at the very least should be placed in lined, state-of-the-art landfills, she said. TVA’s Kilgore said that chemicals in the ash are of concern, but that the situation is probably safe. The power plant is still operating, sending the ash to a larger pond on the site. Officials were monitoring a water intake that serves Kingston City and is only a few miles downstream from the Kingston plant, but said no problem had been noted there as of Monday afternoon. The power producer, which oversees the Tennessee River system, had slowed river flow in the area, releasing less water from key dams, so the pollution might be better contained for possible cleanup. TVA has insurance for an event like this, spokeswoman Barbara Martucci said, but what the cleanup cost is and how much insurance will pay remains to be determined. Otherwise, ratepayers in Tennessee could bear much of the costs. TVA provides virtually all the electricity in the state, along with parts of six others. Contact Anne Paine at 615-259-8071 or apaine@tennessean.com.